The Cobra MT250C 4-in-1 Multi-Tool is powered by a 25cc engine. 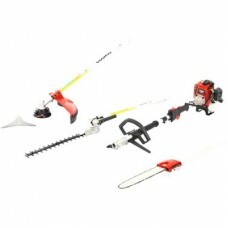 It includes 4 quality attachments - grass trimmer, brushcutter, pole pruner & articulating long reach hedgecutter. Expertly powering Cobra Multi-Tools, this 25cc engine provides all the power your Cobra multi-tool needs. The 2-stroke engine produces consistently strong power delivery together with state of the art engine technology, whilst achieving reduced fuel consumption and industry leading low emission levels. Double line for long grass & undergrowth. The Cobra MT250C petrol Multi-Tool comes complete with a nylon line tap 'n' go grass trimmer attachment for mowing and thinning. Also included is a robust guard for increased operator safety. The quality nylon line is automatically readjusted by simply tapping the cutting head on the ground. The newly released line is then cut to the optimum operational length as you continue using your brushcutter. Double line for long grass & undergrowth The Cobra MT250C petrol Multi-Tool comes complete with a nylon line tap 'n' go grass trimmer attachment for mowing and thinning. Also included is a robust guard for increased operator safety. The quality nylon line is automatically readjusted by simply tapping the cutting head on the ground. The newly released line is then cut to the optimum operational length as you continue using your brushcutter. Even easier to cut at various cutting angles The Cobra MT250C petrol Multi-Tool comes complete with a 72cm shaft and is fitted with a 43cm / 17" double sided cutting blade with 30mm tooth spacing. The innovative design of the articulating head means that you can easily and smoothly adjust the angle of the cutting blades through 180° at varying increments.